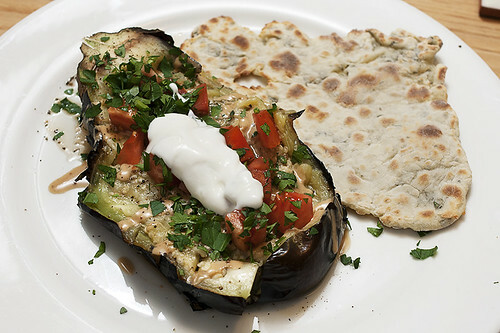 fully-loaded roasted eggplant with yogurt and parsley pita bread, originally uploaded by aarn! +5th January, 2011+. mixed together 1c. of all-purpose flour with a few spoonfuls of whole milk yogurt, a pinch of salt, and a handful of fresh chopped parsley. the dough was very wet, but workable (no idea how much yogurt was actually in there, could have been almost 1:1). cut the dough into two equal sized pieces and rolled it into oblong pitas on a floured work surface. placed the rolled out dough onto a pizza peel and transferred to a hot baking stone in a 425-degree oven until brown, then flipped and repeated. rotated a raw eggplant atop a stove burner on high heat until the outside was charred and the flesh was tender to the touch. sliced the eggplant in half, put one half on each plate, and splayed the halved eggplant like a baked potato. smeared some garlic paste (garlic, olive oil, salt, and a little lemon juice, worked together into an emulsion in a mortar and pestle) onto the open flesh side of the eggplant, then drizzled on some tahini, honey, extra virgin olive oil, and lemon juice. topped the eggplant off with some diced tomatoes, parsley, thyme, salt, pepper, and a dollop of whole milk yogurt. served with the pita.